The Monte Carlo 6 boasts great harmony between incredibly spacious living spaces and a layout marrying interaction with privacy. 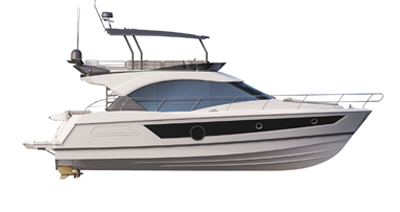 Top quality materials and detailed finishes offer a unique lifestyle for a motor cruiser this size. The interior boasts a spacious and open design, seamlessly connecting the galley at the centre of the boat with the huge lounge and central steering station. With three beautiful cabins with en-suite heads, below deck is the paragon of luxury. The Monte Carlo 6 can be highly personalized, offering kitchen worktops and shower room washbasins in a typically Italian marble. There is also a choice of woodwork atmospheres between light brushed oak and warmer matt walnut. The color of the hull is available in a variety of shades. At the center of the main deck, the steering station is equipped with the latest technology. It has large 16” or 24” SIMRAD screens which offer all the information needed to navigate. The single-piece windshield offers perfect visibility and the highly comfortable driver’s Besenzoni seat has integrated controls. The whole of the steering station benefits from an innovative layout. Spacious flybridge saloon, large sofa seating 8-10 people. Fold-away teak table. Large sun-lounger aft of the flybridge, supplemented by a second forward relaxation space, with two remotely controlled sun-loungers. Pop-up lights for a lounge atmosphere. Opening side-glazing, optimum visibility and safety. Steering station with 2 x 16” Simrad NSS or 1 x 24” Simrad NSS. Perfect visibility thanks to a windshield in one piece. Central control station, driving seat with joystick controls included.